I read this article and found it very interesting, thought it might be something for you. 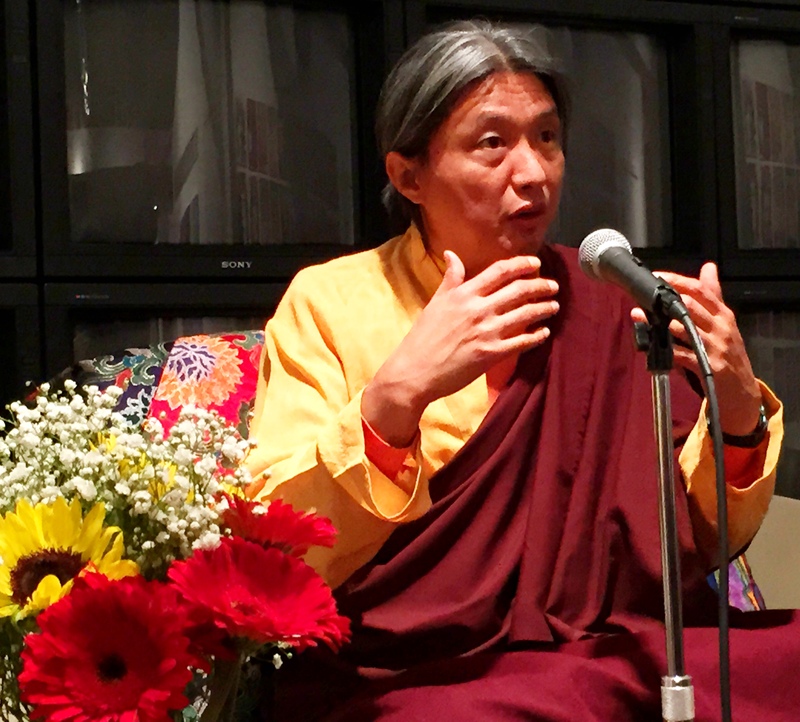 The article is called Dungsey Gyetrul Jigme Rinpoche’s Open Talk in Kiev, Ukraine: A Message to Humanity and is located at https://www.ripaladrang.org/dungsey-gyetrul-jigme-rinpoches-open-talk-in-kiev-ukraine-a-message-to-humanity/. “Impermanence is the ultimate reality of this physical world. I was in Ukraine two years ago, and so many things have changed since then. Unfortunately, these changes are very painful and have caused a lot of anger and hatred in the people. It is very important to keep a sense of humanity under any circumstances. Without a sense of humanity, we are lost. I know that many of you feel anger, hatred now. But they cannot help you to solve problems. We know this through the example of the relationships inside our families. Feeling sadness about the loss is not the same as anger. Please, try to keep basic positive feeling of humanity. In this case, we have the opportunity to move forward. Anger and hatred are useless on their own. Everyone can develop the sense of humanity, and this can influence the world. Recently I finished my personal, solitary retreat, where many times I was praying for Ukraine, for humanity. My country is Tibet. I cannot go to my country now, but I always have the opportunity to pray for my country and people living there. This allows me to feel strong. You all know about the Earthquake that recently happened in Nepal. Many people died and many were injured, lost their homes. When it happened I went to the destroyed villages, and helped people there to bring water and other basic things. We had only one small tent where about forty people were sitting and praying, and in the middle we put a lamp, and made an offering of light to those who died. This is called Marme Monlam Practice that I will teach the Ukrainians during my current visit also. In such a way conflicts unite people. There were no poor and rich at that moment, no educated and non-educated, no young and old. All people were united in their sense of humanity and loving-kindness. Hopefully, after this sequence of earthquakes finishes, people will re-build the country with this sense of humanity inside of them, and they will not lose it. In Ukraine I saw the opposite situation. Instead of uniting people, the conflict increased negative emotions such as anger and hatred inside of you. Indeed, this is the reason why the Nepalese and Ukrainian situations are different. We never know why and how everything happens. We do not know why wars happen. It is not a matter of one day. Ordinary people do not know what exactly Russian or Ukrainian politicians decide. But ordinary innocent people suffer. You should not involve too much in politics. Tibet is also a playground for vested political games of many countries like Ukraine. It is important to stay calm. We spend so much time at our jobs earning money, working, what for? The answer is to live. This means that nobody wants to die. So we put a high value to our lives, and it is better to live without negative emotions inside of us. Then, we will feel happier. We should try to live with compassion. Anger and hatred are not proper answers to difficult situations. I know there are conflicts even inside of families. Why do you suffer due to these outside influences? We have to keep closer to each other, not farther. So, the generation of a positive attitude inside of us can save the world. When I was in retreat, many different kinds of small birds and animals came to me. They were not afraid of me. It means that the external situation responds to our inner state of mind. When we are kind to others, we see the response. It is easy to be kind and compassionate to others when everything is good in your life. But in fact it is not a true compassion. Your real compassion, love and kindness are checked during difficult situations. So, now it is time for you to do that. It is likely that, if we were to live with a greater sense of humanity, treating others with care and respect, then conflicts and tragedies would not happen in this world. THERE IS A SPECIAL BUDDHIST PRACTICE FOR US! The practice has two stages. The first stage is preparation. Please, make your back straight, and let your feet to touch the floor [if you sit on a chair]. Forehands press the belly (but not very hard). The second stage. We breathe in the fresh air, like nectar that can cure us. We breathe out all the suffering to the space. Please, repeat this many times. Try to be very conscious to get rid of all your suffering. Feel your every negative emotion and get rid of it when you breathe out. If we would like to help others in such a way, not only to us, there is another version of this practice called Tonglen in Buddhism.